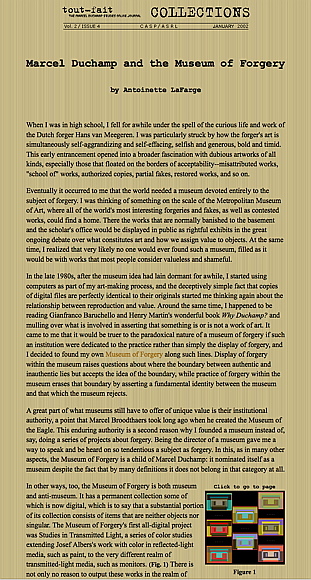 In 1990, I founded the Museum of Forgery as a project in what is now known as institutional art, with the idea of examining the many taboos and shaky arguments surrounding forgeries and other kinds of copies in art. 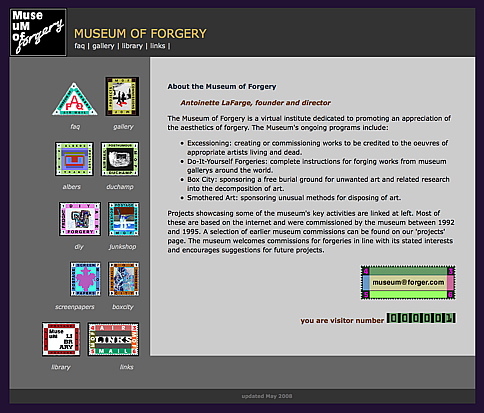 In 1993, the Museum moved onto the web. Although it has been dormant for several years, it was responsible in part for setting me on the path that has led to my current fictive art research project. Examples of the Museum's activities include creating 'posthumous' projects for the oeuvres of dead artists (an aspect of a larger strategy I term 'excessioning'); theorizing 'generics' as a post-Duchampian modality; and offering detailed instructions for do-it-yourself forgeries. I have created the majority of the Museum's projects myself, with the remainder having been commissioned from other artists for the Museum. In 2003, the Museum of Forgery participated with the Institute of Cultural Inquiry in a joint exhibition at Sam Francis Gallery, Los Angeles, entitled "Conversations". This invitational exhibition was one of a series that highlighted pairs of artists with a shared history of conversations about their work. Over the years, I and the director of the ICI have discussed such topics of mutual interest as collections/archives, secrets/codes, mutability/mutation, games/rules, portability/compactness, and memory/traces. Both the MOF and the ICI chose a selection of artworks that they either created or commissioned, displayed in matching vitrines. Links on this page lead to two articles about the MOF: one by me, and one by Katherine Nelson (an interview). WebMagazine, 1996: "Here you'll find heady homages to Josef Albers and a 'posthumous' piece by the granddaddy of art cons, Marcel Duchamp. A do-it-yourself forgery section treats pilfering ideas as a wholesome arts and crafts project. When you're finished with that, learn how to use art as a mulch alternative, or throw it on the barbie for one helluva meaty steak: It'll keep you busy for hours." 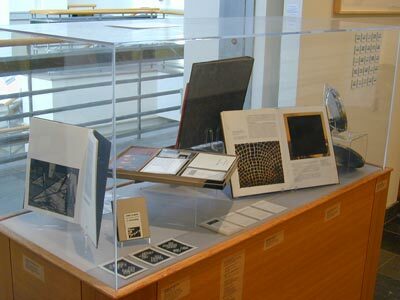 "Marcel Duchamp and the Museum of Forgery"
"Here you'll find heady homages to Josef Albers and a 'posthumous' piece by the granddaddy of art cons, Marcel Duchamp. A do-it-yourself forgery section treats pilfering ideas as a wholesome arts and crafts project. When you're finished with that, learn how to use art as a mulch alternative, or throw it on the barbie for one helluva meaty steak: It'll keep you busy for hours."